Waking up to get ready for school can be a struggle in itself. The last thing you need to worry about is taking half an hour (or longer) to do your hair. To take the stress and under eye bags out of your mornings, we’ve compiled 10 back-to-school hairstyles that you can do in under 10 minutes! This way you can press the snooze button a few more times before sleepily eating breakfast and running out the door. I don’t know about you, but back-to-school used to be my favourite time of year. Shopping for supplies, buying new back-to-school outfits, and of course a clean-slate planner. Unfortunately, Youtube didn’t even exist until I was half way through high school, but now the platform boasts hundreds of awesome tutorials for any hairstyle you can dream of! So if you’re looking to impress by way of your locks, we’ve got you covered. Whether you’re in elementary or high school or are heading off the college, these back-to-school hairstyles work for any age. And with styles perfect for short, medium and long hair, you’re sure to find gorgeous look just for you! An upside down braided messy bun looks feminine and effortless. It looks great from the front and the back and keeps the hair off of your face, which is ideal for classroom learning. It may take a bit of practice to get the braid just so, but after following this step-by-step tutorial, you’re sure to ace it in no time. Just like your tests! With a different hairstyle for every day of the week, these simple step-by-step hair tutorials ensure you’ll never go a day without looking your best. From a simple high pony that will keep your hair out of your face to cute space buns, you can rock whatever fun hairstyle you desire! If you’re really running short on time in the morning, these three 1-minute hairstyles will be your saving grace. Perfect for medium and long hair, as well as hair with layers, these styles are cute and extremely simple to do. All you need is a few bobby pins and a hair tie for one of them and you are all set! This hairstyle takes some time and effort, but it still won’t take you over 10 minutes! The braided crown is super chic and with loose waves, it will have you looking amazing all day long. It’s feminine, effortless, and simple to do once you get the hang of it. Make sure to use a curling wand like the Hot Tools Flipperless Curling Wand, which can be used to create tight curls or tousled waves. We love it! Having short hair doesn’t mean that you can’t create cute hairstyles. These two easy braided styles are perfect for short bob cuts. You can dress them up or down and whip them up in a cinch before heading out the door in the morning! All you need are some bobby pins and a spritz of hair spray such as the Toni&Guy Casual Hairspray like she uses, and you’ll be on your merry way! If you pressed your snooze button a few too many times, don’t fret, this twisted side braid will have you out the door in no time. It takes about three minutes, and this easy-to-follow tutorial will show you just how simple it is. It’s a natural, soft look that will hold throughout the day as you run from class to class! 7 hairstyles in just 7 minutes? Count me in! Ideal for mid-length hair, each of these hairstyles were made for gals who have recently chopped their long locks or are growing out a short ‘do. You can put on some fun jams in the morning like the one in this tutorial to get you amped up for your classes as you get ready! A half-up top-knot is a great hairdo to sport with a casual outfit. Since it’s best to feel comfy in the classroom, it’s sure to match with lots of your getups. In this tutorial she uses hair extensions for more volume, but it’s not a necessity. All you really need is hairspray, an elastic, a comb and bobby pins for this cool and casual look! Braids are the perfect back-to-school hairstyle. They’re simple, polished and keep your hair out of your face while you study. I find that braided hairstyles can seem a little tricky, but this tutorial guides you through each of the ‘dos step-by-step so there’s no guessing on your part. Each braid is as gorgeous as the last and will definitely make heads turn. I love each and every one of these 10 hairstyles for short hair. They’re quick, easy, and every one of them will make you look extremely chic with little effort. She gives you options for both straight and wavy hair, and if you have naturally straight hair you can use a Hot Tools Curling Wand to get the naturally wavy look. With ten options, you’ll never run out of hairstyles for your day to day looks! These 10 back-to-school hairstyles will have you looking cool and chic from day one. And in less than 10 minutes, you’ll be up and out the door each morning in a flash! 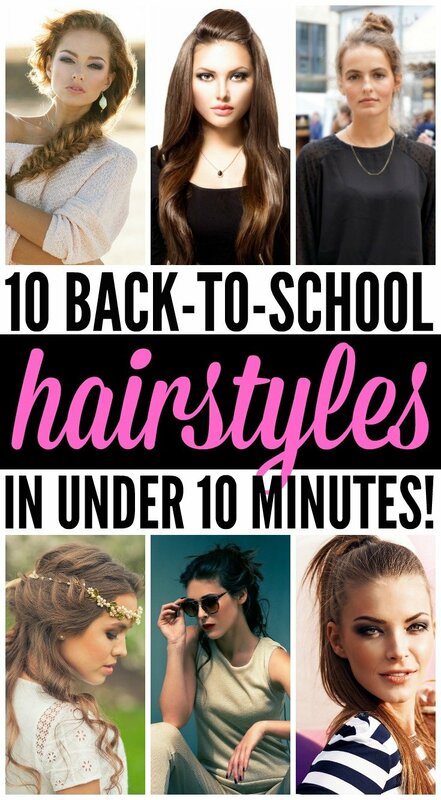 If you liked this collection of back-to-school hairstyles, please share it on Pinterest! And if you’re looking for more ways to keep your hair looking trendy and stylish, please follow our Hair board where we share all kinds of fabulousness!